Happy December Everyone! I still cannot believe it is December 10th already, which means it is only 15 days away from Christmas. I cannot wait to spend quality time with my family and friends and truly enjoy the magic of the season, but I guess I better work on finishing my shopping. CH and I have been busy this week getting ready for Christmas: we bought our tree from the St. Lawrence Market (the same man has been selling trees at the farmers market for 26 years!) 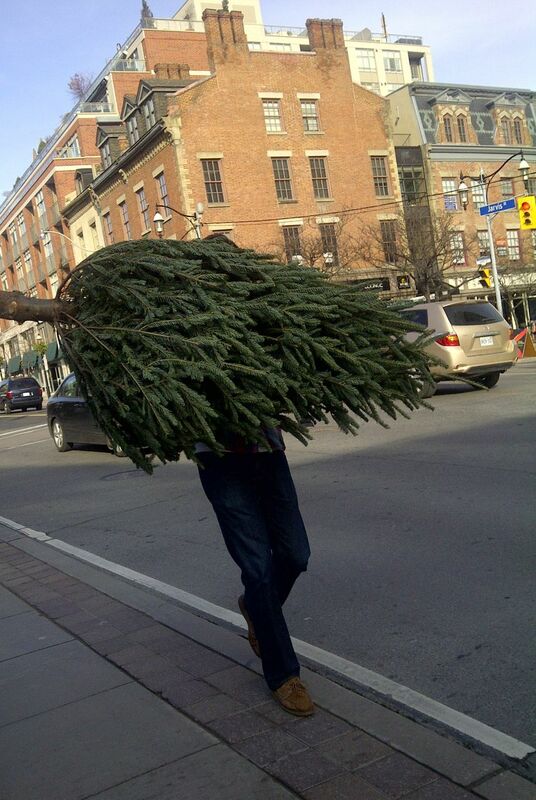 and CH got to carry our tree home (yes, he felt like a lumberjack – see below! ); we went to the 2nd Annual Outdoor Christmas Market in the Distillery District (which was absolutely incredible and immediately put us in the mood for Christmas); we decorated our apartment, our tree and had our first Cranberry Ginger Ale of the season, spiked with vodka of course, all the while watching Miracle on 34th Street; and the weekend was completed with an exhausting, but absolutely rewarding day in the kitchen with a good friend, baking Christmas treats until we couldn’t stand anymore. 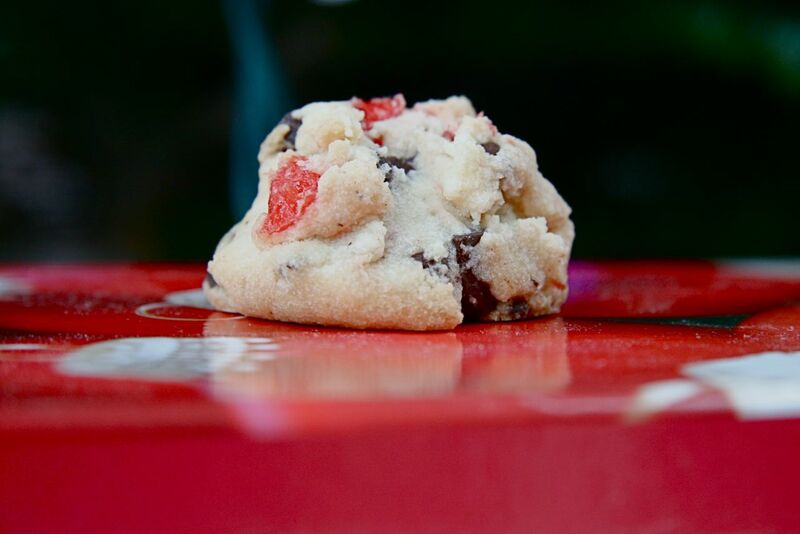 Many of the recipes Kate and I baked together will be shared in the coming weeks, but today’s recipe is definitely going against the saying “Save the Best for Last” because these Chocolate Cherry Shortbread Cookies, were definitely the BEST thing we baked the entire day. These are Kate’s family cookies, her Mom made them for years, and then Kate started making them, and then she made them Vegan friendly. Either way, Vegan or not, these are delicious and the perfect cookie for company, a gift or to eat all alone while no one is watching. These are definitely going on my annual Christmas baking list, and I know if you give them a try, it will be on your list too. The recipe below is the non-Vegan recipe, with notes in brackets for the Vegan adaptations. Using your stand-mixer with your beater blade (or in a large bowl) beat together the butter and the sugar until light and fluffy. Mix in vanilla. 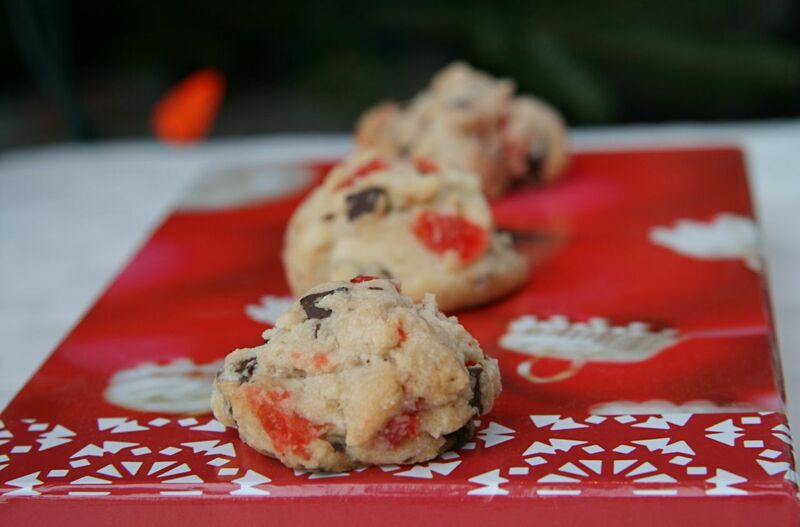 Stir in chocolate chips and cherries to the cookie batter. 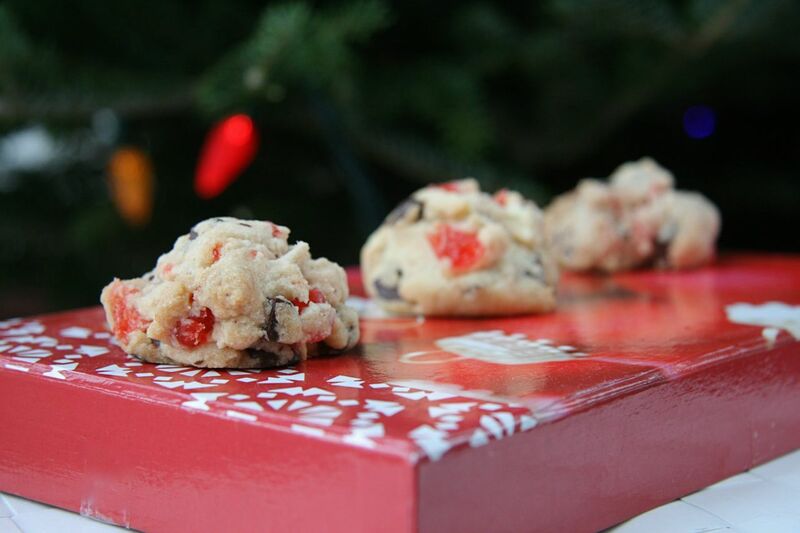 Drop the mixture by spoonful (about a generous tablespoon each cookie) onto ungreased or parchment-lined cookie sheets. Bake 25-30 minutes (adjust to about 18-20 minutes if baking in convection oven). Remove from oven and allow to cool completely on a wire-rack. Recipe From Kate SC – originally from Hershey’s.